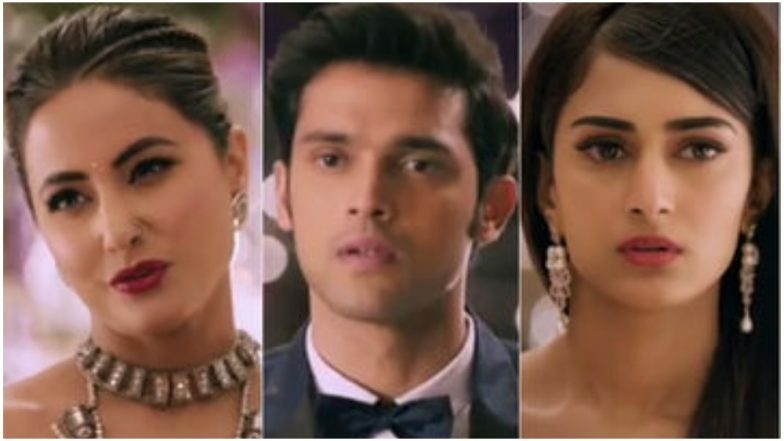 Today’s episode of Kasautii Zindagii Kay 2 starts with Mohini and Komolika (Hina Khan) sitting on the dining table having breakfast Just then Anurag (Parth Samthaan) comes and tells them that he has an important meeting and he cannot have breakfast. He gets a call from the office and comes to know that the meeting is cancelled, he says still he is coming in the office. Anupam taunts him and says if the meeting is cancelled then why he is going, is he not liking to stay at home. Komolika says Anurag to come with her for shopping and forget about any meeting, Mohini also tells Anurag to go with Komolika. There Veena calls Prerna (Erica Fernandes) and says that Shivani has got an alliance for marriage and that Shivani also agreed for this. Veena says that they are going to come in the evening to see Shivani and tells Prerna to buy a good suit or saree for Shivani if she has time. Prerna tells her to give the phone to Shivani, she asks her if she is ready for the marriage. Shivani says she is ready as she wants Veena to be happy. Prerna tells her to come to the mall which is near to their house. Meanwhile, Komolika and Anurag shop for their pooja, as Komolika goes to change in the dressing room, Anurag sees a saree and likes it for Prerna, Prerna also is shopping there, she likes the same saree and goes to change. As Prerna goes to change she enters the same dressing room where Anurag is there. Prerna finds it difficult to open the door and tells Anurag to open it. There Komolika comes out putting the dress and searches for Anurag. Inside the room, Prerna tells Anurag why he is coming close with her, Anurag says this is what she wants and comes close to her, she pushes him away, both fall down and see each other with love (mey tera mey tera piya track is played in the background), but Anurag says he cannot stay like this with her as Komolika will feel bad, Prerna gets up angrily and tells him to open the door. Anurag wants Prerna to get angry with him as she will not come to know that he still loves her and starts fighting with her. Prerna says that she does not love him but she will not leave him as she will not let him be happy in his life. There Nivedita and Anupam are having some romantic time with eachother, Mohini comes and tells she wants to talk some important thing and takes Nivedita with her. Komolika dashes with Shivani and starts abusing her and says what is she doing in this expensive mall, Shivani says that Prerna is also here. Komolika gets angry and goes from there. After knowing that Prerna is also there she suspects that might be Anurag is with her and goes to check in the changing room. She bangs every room, Prerna hears her voice and smiles seeing Anurag, as what will he do now. In the precap, Prerna tells Anurag that he is a big flirt, Anurag tells Prerna that she still loves him.